The Southend Punk Reunion Gathering took place on Saturday October 7th 2006 and was a great success. Thankfully Giacomino Parkinson of Southend Sites and The Dim Locator took some shots of the event, providing illustrative vignettes of the evening (see the above galleries for the photographs). Punks both past and present and from all eras attended - including known representatives from such bands as The Kronstadt Uprising, The Bleeding Pyles, The Sinyx, Thee Armless Teddies, Autumn Poison, The Stripey Zebras, The Get, Taming The Outback and The Beers-In Brothers. On the night Smarty, The Prey, Retrospex , Phil Black of Anorexic Dread and The Vulture Squadron all performed to an enthralled crowd, and many people managed to reconnect to the source and catch up on the lost years. Apologies to anyone whom we didn't manage to make contact with, or photograph at the event. enjoy the Galleries - More events will be planned. 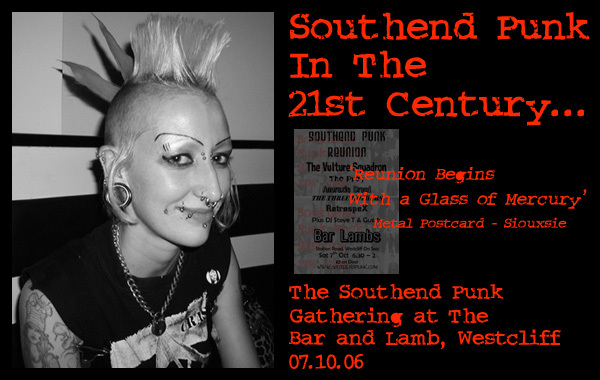 Thanks to Andi Schurer for pulling this event together, and on a personal note I'd like to extend my gratitude and thanks to all of you whom told me how much they have enjoyed the website - Southendpunk.com - it's made all the late nights and long hours worthwhile.